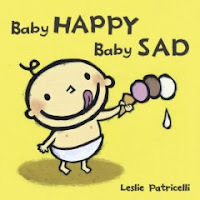 Silly, silly, silly and as pitch-perfect as a baby's scream on an airplane are Patricelli's board books, capturing the discoveries and tribulations of the diaper set. Whether learning the proper use of the potty or the peg mallet, giving daddy chase or obligingly holding hands, sitting demurely amidst toys in the tub or having a "eureka!" moment with a finger up the nose, this fetching little baldy plays out baby's best and most natural instincts on every page. Black outlines (a la Lucy Cousins' Maisy) against bold scritchy-scratched acrylic backgrounds happily catch and hold the eye. 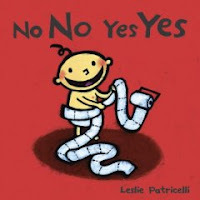 All of Leslie Patricelli's books brim with plenty to recognize for both parent and child; this, along with BABY HAPPY, BABY SAD, are her latest. 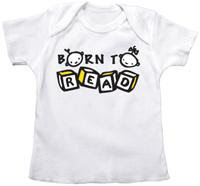 Pair her titles with a nice "Born to Read" onesie for a sweet little shower gift. Yes, yes! Let's keep on keepin' it short and sweet...for the shortest and the sweetest: babies! It's never to early to start reading aloud, you know! WHO'S HIDING? 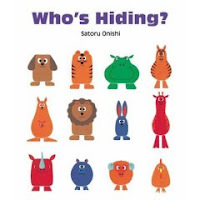 by Satoru Onishi (Kane/Miller) Who's hiding? Who's crying? Who has horns? Who's sleeping? Who's backwards? Who can possibly resist the simple and recognizable patterns of snazzy stylized animals, all lined up for your child's repeated point-at-the-picture pleasure? Colors, animals, and a keen eye are all honed in this cleanly designed and clever concept book. PEEK-A-WHO? 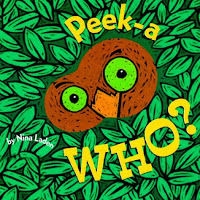 by Nina Laden (Chronicle) Peek-a-Moo? It's a cow! Peek-a-Boo? It's a friendly little ghost! Peek-a-Choo-Choo? Look what's coming down the track! Peek-a-Zoo? All the animal friends have come to say hello! And as for peek-a-YOU, there is a little child-safe "mirror" for the grand finale and a big smile. The cuteness quotient is off the charts, and even the smallest children will love the confidence of knowing what comes next. An oldie but goodie, this little book is sure to be a big hit at your house, if it isn't already. CLASSIC ANIMAL STORIES, compiled by Cooper Edens (Chronicle) All right, I know this is cheating as it is not a book for babies per se, but my goodness, it's hard to imagine entering kindergarten without having sampled every bit of what's between these bindings. Lovely mannered original versions, poems and excerpts abound from very classic work such as The Goose Who Laid the Golden Egg, Fuzzy Wuzzy, Lassie, Peter Rabbit, The Ugly Duckling, Goldilocks, Octopus's Garden, Zippity Doo-Dah, Town Mouse and the Country Mouse, The Spider and the Fly, The Frog Prince, The Owl and the Pussycat, as well as choice excerpts from Lewis Carrol, Aesop, A. A. Milne, Rudyard Kipling, Emily Dickinson, and mucho Mother Goose. Whether you whip it out when you're not sure how to make a conversation with a nursing baby or using it to send off a preschooler's nodding head to dreamland, this treasury has an accent on treasure, and will serve a child's recognition of literary allusions for years to come. Bedecked with classic turn-of-the-century artwork, you may need a second copy to rip out pages (gasp!) 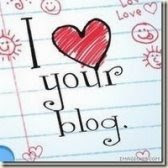 for framing and decoupage.